Has the time come to babyproof your house? Have you only just realized windows need to be babyproofed and find yourself scrambling for solutions? 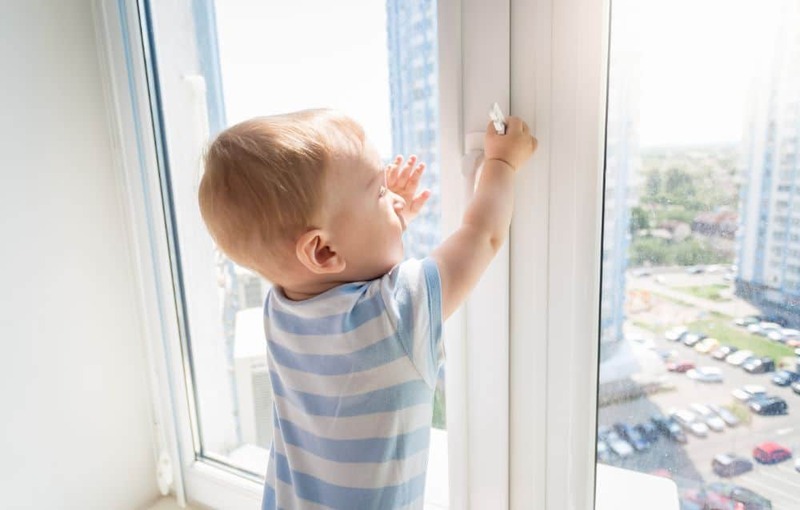 When most people think of making the home safe for growing little ones, many think of covering hard corners and moving dangerous chemicals out of reach — but windows babyproofing treatment too. Fact: growing babies are little escape artists, many with skills even Houdini would find impressive. Over 5,000 children are injured each year falling from windows (source). That number doesn’t even include children who are injured by glass from broken windows or window cords. So what’s the best way to babyproof windows? What’s most cost-effective? How can you ensure your little one is safe? Keep reading for your ultimate guide to babyproofing the windows in your home. The first step to babyproofing your windows is to figure out what kind of windows you have. Each kind of window uses different mechanisms to open and close, so you will need to use different babyproofing methods to make them toddler-friendly. Awning windows crank open on a hinge, to allow the window pane to go inward or outward from the top. Because these windows open up at an angle they allow for great air flow and are easy to clean. Casement windows, like awning windows, have cranks to open them outward or inward (source). The difference is that they open from a side hinge instead of from the top. This window is not common in homes, because although they are the second most watertight window available, they have more parts to break, and most window A/C units won’t fit in them (source). Hung windows are one of the most common windows in homes. They come in both single-hung and double-hung options, making them versatile. Single-hung options have a bottom window that slides up when unlocked (source). Double-hung windows allow both the top and bottom of the windows to slide up and down when unlocked. Some single and double hung windows have mechanisms that also allow the top and bottom portions to pull out at an angle. This allows for better airflow as well as makes them easier to clean. A sliding window, sometimes called a slider or gliding window, are windows that have panels which slide open and closed horizontally (source). Since many modern windows are now retrofitted with screens in order to allow airflow while keeping out dirt and debris, you might think window screens are enough to keep your baby from falling through — they aren’t. This is because window screens are thin and flimsy. In many cases, your baby falling on them may be enough to break them. This puts your baby at risk of falling through the window and onto the ground below. No matter what measures you take to babyproof your windows, it’s important to tell children playing with the windows is not allowed and tell them why. It’s also important to be consistent. If they climb up to the window, redirect them every single time. It will be exhausting, but will also help them to eventually realize playing with the window is not worth it and enforce that it’s against the rules. Have a plan: It’s important to know exactly what the boundaries are you want to set, so if they have questions, you will have answers. Keep it simple: Have a short and precise explanation for why you set the boundary. Be firm but warm: Tell your children the rules in a firm, yet warm manner. It doesn’t take yelling to let your child know that you’re serious. Staying open may also make them less defensive to what you’re saying. Expect an upset: It’s likely your child will not comply with your boundaries the first time or even the first several times you lay them out. They want to do what they want — and you’re telling them no.The will probably get upset, that’s okay. Plan for this so you can handle it without getting frustrated. Even if your window is high enough you think your baby can’t reach it, don’t ignore the items you have around it — they too can cause safety hazards. Relocate: Move items such as furniture, toys, and baskets away from windows. These can be used as ladders for little ones to climb on. Eliminate temptation: Babyproofing doesn’t stop there. Remember to put away anything that can be stacked, such as books your baby can climb on. Remove hazards: Put away anything like balls, marbles, or hard toys that can be thrown at, and break, your windows. This suggestion might seem simple, but sometimes even the simplest solutions can make a big difference. Many window locks take a bit of strength to open — at least a bit more than your average toddler has. If you want to go a step further, you can also use permanent locks to keep windows shut from the inside as well. If your home already has window locks, but you don’t have the key for them, you can have the locks refitted for new keys — or pay someone to install new ones for you. This option tends to be more expensive. While locks can be a big help for those who want to pay the money for them, they also require you to keep the windows closed the entire time they’re in use. So if you want to keep your windows open at all, you’ll need a second option as a backup. One type of window stop is the window wedge. This wedge-shaped tool can be used with single and double hung windows, as well as sliding windows. The wedge stops the window from moving any further than the place that you put it. This means you can open the window two or four inches, but use the window stop to prevent it from opening any further. This allows you to have air flow from your window, while still keeping your baby safe. It’s best to not open your window any more than four inches because that’s the average width of a five-month-old’s torso — any bigger of an opening could allow your child to fall through. Charley bars are often used to secure sliding glass doors, but they can also help babyproof sliding windows. Just place the bar high so it’s out of reach for your child and make sure to turn it upside down, because the window can be opened if it is turned upright. Many charley bars come in adjustable sizes, but others can often be cut down to fit your window size if you can’t find one that fits outright. Many of us know babies are some of the best escape artists around, but did you know many of them have an arm that could rival a major league pitcher? My son once threw a toy across the room, hitting an ornament that had been put out of his reach, causing it to fall and shatter into pieces. I cried, and then thought about what else he could break — enter window film. Window film is a translucent film you can place on top of the glass on your windows. It can be applied to a window, or any glass, including windows that don’t open. The film doesn’t keep the glass from breaking, but will contain the broken pieces to keep your child from getting hurt. Many window films are UV treated so they will keep your skin protected in more ways than one. Awning and casement windows both open either inward or outward, making it easy for babies to climb through. You’re going to need to take an extra step in order to keep your baby safe if you have these windows in your home. A window guard is a series of bars set close enough together, so your baby cannot fall through. There are sizes out there to fit just about every window and can be placed inside or outside of your home depending on how your windows open. 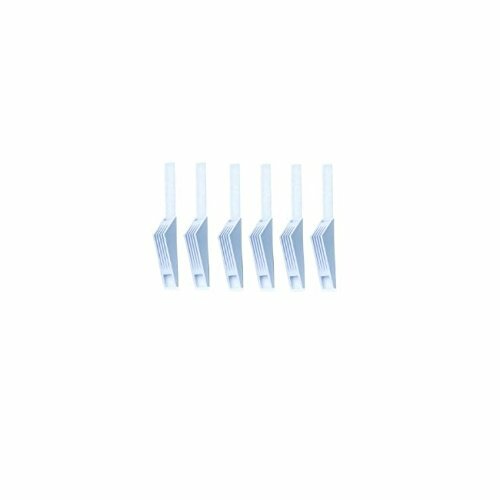 Unlike security bars that are often screwed into the window, making them next to impossible to get off quickly, these are easily removable by an adult. Meaning they are not a safety hazard in case of a fire. Another way to babyproof awning or casement windows is to simply remove the crank mechanism. Usually, this can be done simply by screwing the handle off. This, of course, only works if you want to keep the window closed. Window blinds also need to be considered when it comes to babyproofing your windows. In fact, from 1990 to 2017 window cords accounted for roughly 17,000 emergency room trips in children (source). The best thing to do to prevent these types of injuries is replace your window treatments with cordless options. However, as you can imagine, that can be expensive. If you don’t have the funds to replace all of your window treatments, you can put your focus on keeping the cords out of the reach of your child. An inexpensive alternative is to place a hook on the wall nearby and wind the cord around it, putting it out of reach of your children, but also keeping it organized and accessible to you. Another often forgotten part of your home when it comes to babyproofing is the window sill. Your baby can’t fall through them, get choked by them, or have them break but window sills often have sharp corners, and your baby can fall on them leading to bruises, cuts, and even concussions depending on how hard they fall. To babyproof window sills focus on padding the corners. That way if your baby falls, they will have a softer surface to bump into. Also, pay attention to how high your window sill is from the ground. Window sills are often looked at by little ones as great climbing opportunities, and even if you’ve moved furniture and stackable objects out of the area, they can sometimes still climb if the window sill is low enough. Unfortunately, there is no real way to keep children from climbing on lower window sills, so this is where the boundaries and clear-cut rules come into play. One thing you should consider if you have a basement in your home is whether or not your children have a way to get out of the basement windows in case of fire. We’ve been focusing on making sure kids can’t escape through windows in this article, but if you spend time in your basement, you should have an escape route planned that uses the windows. In the case of an emergency — your basement exit blocked off by fire, for example — you should have an alternative exit. Many city codes require basements to have egress windows or windows large enough to exit or enter in case of an emergency (source). If your basement doesn’t have an egress window, consider adding one in if funds allow. If you don’t have the funds available, make sure you have a ladder or chair available that can be moved to the window in case you need to make an emergency escape. Identify your windows: The types of windows you have will make a difference in the way that you babyproof them. Spot the hazards: Walk through your house and identify all hazards in regard to your windows. Don’t forget to think about window sills, blinds, and basement windows as well. Consider budget: Your budget will decide if you can do things like placing permanent locks on all your windows or replacing all the window treatments with cordless ones. If you do not have the budget for these measures, you can explore other options. Pick your method: After determining your windows and budget, look at the different options available and choose what’s best. Review: Did you miss anything, such as objects your child might throw to break the window? Or stackable items they can try and climb to escape? Now is the time to fix it. We know that babyproofing can be stressful. You want to anticipate every possible hazard in order to keep your baby as safe as possible. Sometimes, you might be tempted to roll your little one in bubble wrap and call it a day. Luckily, modern provisions allow your little one exploratory freedom while giving you peace of mind. Do you have any tips for babyproofing the windows in your home? We’d love to hear your ideas in the comments section below. If you know parents who are preparing to babyproof, share this article with them to give them a helping hand!